Our skin is our first line of defense against the harshness of the world. Our skin protects us from viruses and bacteria. It keeps us warm when temperatures plummet, and cools us off when the air boils over. It shields our organs, nerves, and blood vessels and can even transform simple sunlight into that all important vitamin D.
Keeping your skin healthy is vital to your overall health. For me, good skin health has always been a little harder to come by. I battled acne as a teenager, I have a fair complexion that burns at the mere mention of the sun, and I live in Utah—home to some of the driest air on the planet. Now that I’ve hit the middle of my life (*crosses fingers*), I’ve become more mindful of the time I spend in the sun, moisturizer is my new best friend, and I deal with the occasional pimple with a good old-fashioned squeeze. But I’ve also learned that good skin health works from the inside out, and there are plenty of foods you can eat to help keep your skin healthy and defend against exposure and age. Coffee is a miraculous brew. The drip-drip-drip of my old coffee machine and the waft of rich notes that follow has tugged me out of bed countless times (I love coffee; in fact, this post could easily derail into an ode to coffee). But it’s more than just go-juice; coffee has a heap of healthy perks and that includes benefits to your skin. A steaming cup of joe contains small amounts of vitamins B2 and B5, as well as trace amounts of calcium and magnesium. But it overflows with antioxidants, and that’s where java can really save your skin. Antioxidants work to rid the body of age-causing free radicals, and caffeine (yes, caffeine is an antioxidant) has been shown to help slow DNA damage. Plus, a recent study published in the Journal of the National Cancer Institute reveals a link between drinking coffee and lower rates of melanoma. Like coffee, dark chocolate has a slew of properties that are great for your skin. The flavanols (antioxidants) found in dark chocolate can help protect skin from the damaging effects of the sun’s UV rays. Plus, this tasty treat sparks the feel-good areas of your brain, lowering stress and in turn reducing the amount of wrinkle-causing stress hormones. Dark chocolate also has a less is more quality. Because it’s low in sugar, but sweet enough to satisfy sugar cravings, it can keep your hand out of the cookie jar, which is great because sugar is one of the worst foods for your skin. Just make sure you stick with 70 percent cocoa or higher. The higher the purity, the more gains for your skin. It’s the antioxidant responsible for giving a lot of fruits and vegetables their red color. It’s kind of a big deal, and watermelon just so happens to be loaded with the stuff. And beyond its ability to paint the produce town red, lycopene is a windfall for your skin. It promotes the production of collagen (the protein skin is made from) and encourages the growth of new skin cells. Watermelon’s benefits don’t stop at this powerful antioxidant, either. This summer treat is also loaded down with vitamins C and A. Plus it’s low in calories and sugar. it’s earned its place up and down the grocery aisles. But tread lightly—most pumpkin-flavored treats are packed with sugar. Outside of its flavor-enhancing abilities, future jack o’lanterns are also quite healthy and one of the best foods for skin repair. Pumpkin contains folate (necessary for skin-cell creation), beta-carotene (defends skin cells against oxidative damage), and copper (important for collagen production). And pumpkin seeds are loaded with zinc, essential fatty acids, and magnesium. All of which can help combat wrinkles, and dry skin. Simply roast in the oven and salt to taste for a delicious snack. The next time you hack and slash a pumpkin for a front porch decoration, be sure to save its innards to make a skin-healthy treat of your own. When it comes to eating for a healthy complexion, olive oil is a must. This magical elixir is chock full of antioxidants and vitamin E, both of which smash skin-damaging free radicals. But it’s olive oil’s anti-inflammatory properties that really make it an asset to your skin. Olive oil contains the compound oleocanthal, which can help reduce inflammatory skin conditions such as rosacea and acne. And on top of all of its wholesome traits, olive oil is easy to incorporate into your diet. You can drizzle on salad, brush it on corn on the cobb, use it to stir-fry vegetables, or mix it with Italian seasonings and spices for a delicious bread dip. Consuming this staple of the Mediterranean diet is one of the best things you can do for your outer layer. The above mentioned foods are easy go-to’s for upping your skincare game, but they’re certainly not the only ones. Eggs are nutritional powerhouses and can do wonders for your skin. This core breakfast food contains the compounds lutein and zeaxanthin, both of which have been shown to help provide protection from ultra-violet rays. Plus, the amino acid proline found in eggs is used for collagen production and can help rebuild skin. 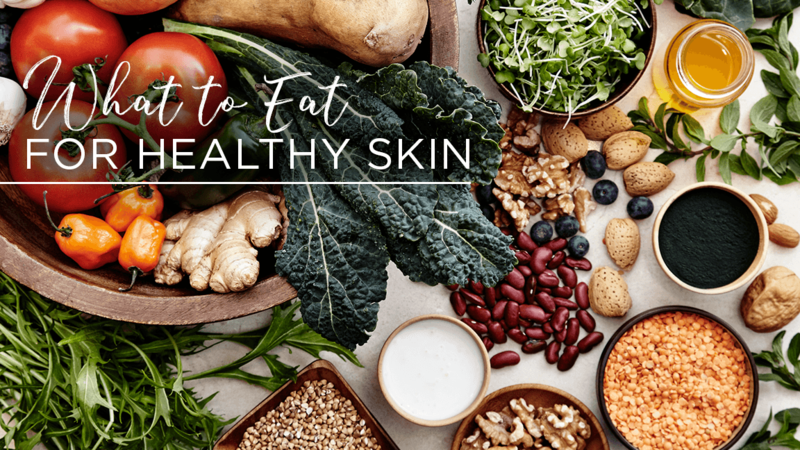 Dark leafy greens, hummus, avocado, and red wine are all loaded with nutrients and are some of the best foods you can eat for a healthy skin glow. And speaking of collagen, vitamin C is perhaps the most crucial ingredient for making this protein building block. Luckily it can be found in healthy fare such as citrus fruits, broccoli, and strawberries. There’s a buffet of skin-aiding foods out there. Just use your favorites to put together your own healthy skin diet plan. And the more of these foods you eat, the less room you’ll have for the refined sugar and processed foods that work against your skin. Throw in a little exercise and quality beauty sleep and your outer armor will shine for a lifetime.